I’m such a dork. I woke up one day with this amazeballs idea for a barbeque sauce and marinade and went to work on it. I thought that a combination of Dijon mustard, maple syrup and balsamic vinegar would be stellar on pork and went to town trying to formulate a recipe. I’ll get to the dork part soon… bear with me. So, I made the sauce, marinated the pork, slow cooked it all day, basted that puppy (piggy? ), served it for dinner and thought I was a rock star. Then I realized something. There’s a reason I thought those flavors went together and there’s a reason I thought it tasted so amazing. I’m from South Carolina. As in, the mustard based barbeque sauce capital of the world. Without realizing what I’d done, all I did was dress up your basic mustard based sauce (mustard, sugar and vinegar) with fancier ingredients. But it was good. And I will be making it again. If you’re looking for a way to feed a crowd and want to be able to tell your friends that you’re serving them a little bit of South Carolina, try this one on for size. And because I'm a dork, I forgot to take pictures of the sauce - sorry! Sauté onion, garlic and butter for 4-5 minutes over medium heat or until onions become translucent. Remove from heat. Add onion and garlic mixture and remaining sauce ingredients to a blender and blend until smooth. Refrigerate until ready to use (makes about 2 ½ cups). Using a filet knife, separate the shoulder meat from the skin without removing it*. 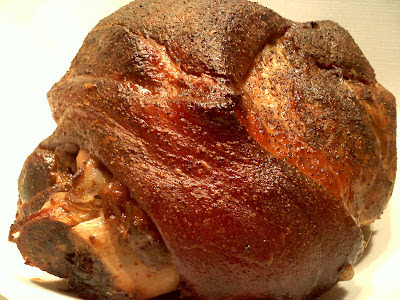 Using your hands, rub the pork shoulder roast with 1 cup of the sauce (taking care to get the sauce under the skin if applicable). Cover, refrigerate and marinate overnight. Place the roast, skin-side down, onto a large roasting pan. Season liberally with salt and pepper. Discard marinade. Bake**, uncovered, at 450 degrees for 35-40 minutes or until the meat is browned and seared. Reduce oven temperature to 250 degrees and remove the pan from the oven. Cover then pan tightly (either with a tight-fitting lid or aluminum foil). Return to oven and cook at 250 degrees for 8-9 hours. Remove pan from oven and uncover roast. Increase oven temperature to 400 degrees. Baste the roast with ½ cup remaining sauce and return to oven uncovered. Cook for 15 minutes. Remove pan from oven, cover loosely and rest for 30 minutes. When ready to serve, remove skin and excess fat from roast. Using two forks, shred pork and place onto a deep serving platter. Drizzle pulled pork with remaining pan juices and serve with remaining sauce on the side. *If your shoulder has the skin intact like mine did – most have a layer of skin on the bottom – think about it like your little roast is wearing a tee-shirt and you want to just separate the shirt away from the roast so that the marinade can make contact with it. I don’t like to remove the skin because it acts as a protective barrier on the bottom of the roasting pan and imparts a tremendous amount of flavor. **This really wouldn't work on the grill or smoker because of the amount of sugar in the marinade. If you'd like to try it using either of these cooking methods, just use the sauce to baste with and skip the marinating step. okay... so i'm a bit slow and just found you! but at least i did. and i'm now working my way thru your recipes and posts. and i got to the part where you said 'has the skin intact' and just had to stop. won't tell you were my twisted mind went but... i laughed all afternoon every time i thought about it! WHHHEEEEE!!!! 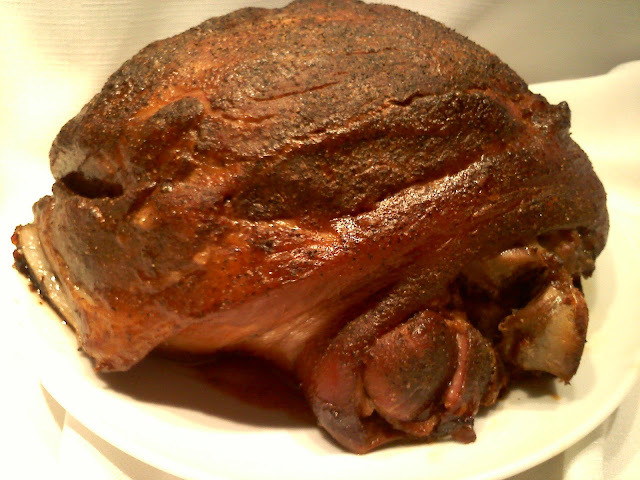 This could be grilled or smoked by using an aluminum pan to catch the juices just as you would cook it in the oven.